The Lemoncraft 'EveryDay Spring' collection is perfect for this time of year because it is happy and cheery and fresh looking with the bright greens and pinks. 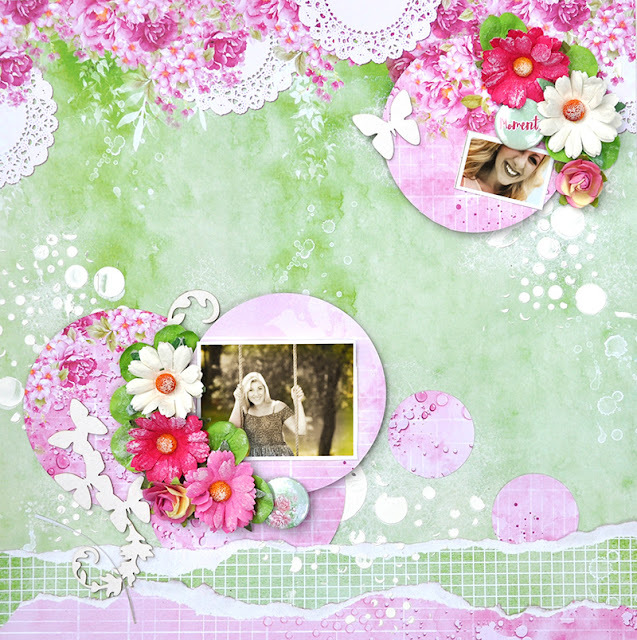 Green and pink are my favorite color combinations. 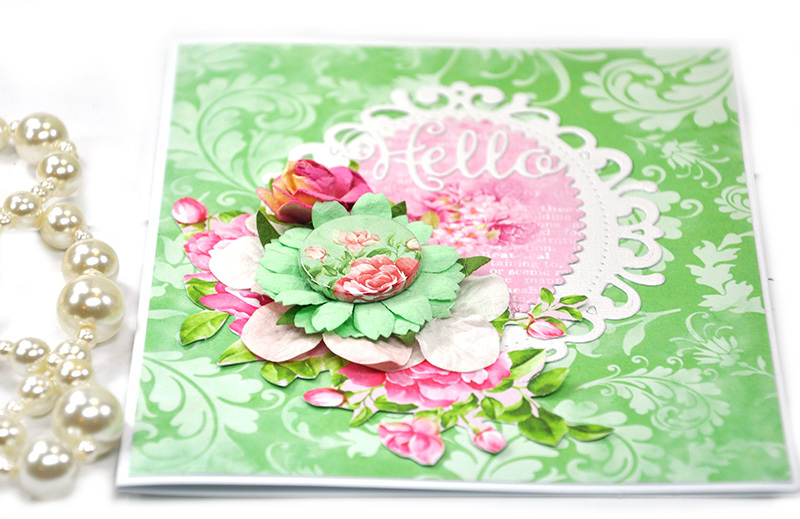 Today I have created a layout and a card using this beautiful fun collection. First, I will present my layout. 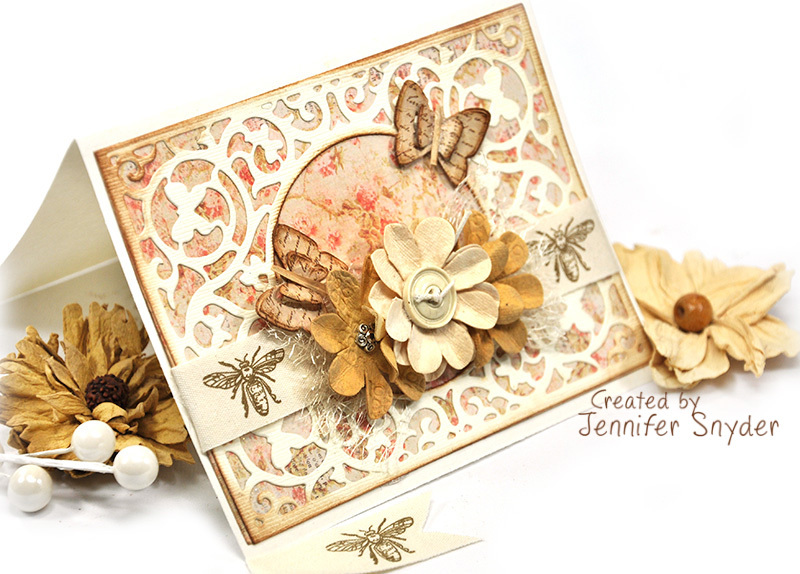 I have included the beautiful LemonCraft chipboard to match the collection. 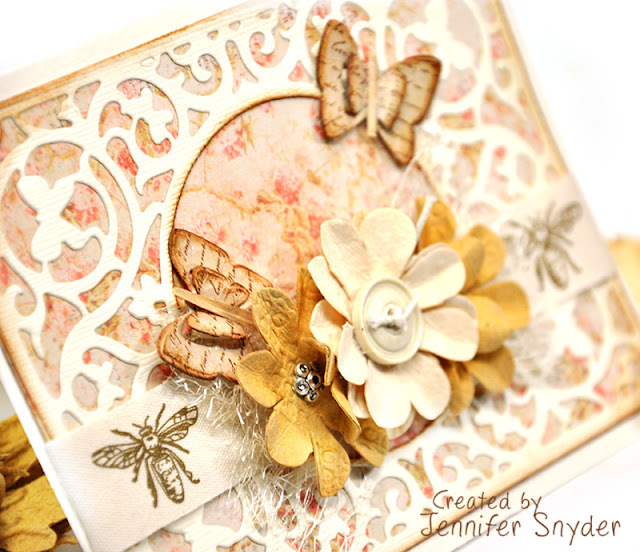 You can see the chipboard flourish with butterflies I added. 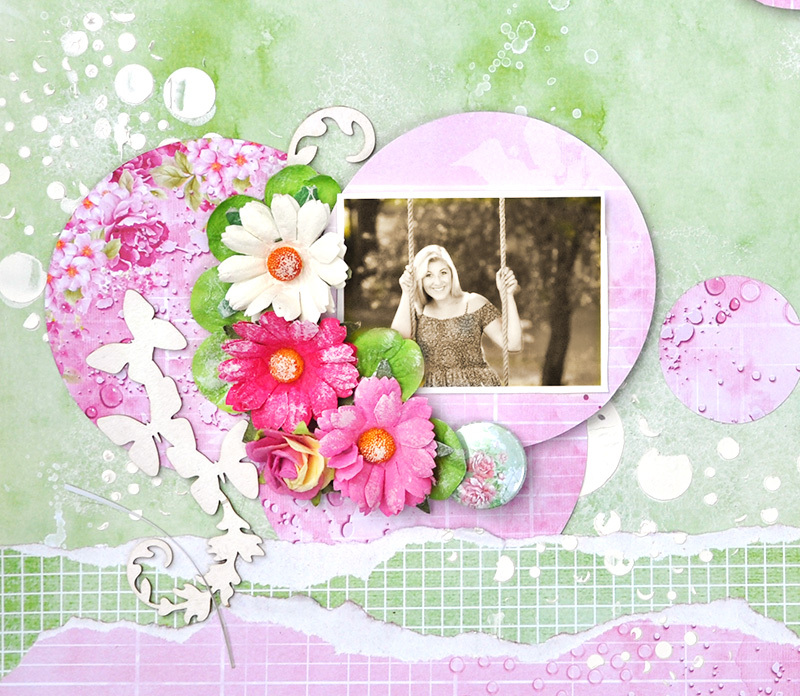 I also used the fun buttons and cheery flowers from the collection. 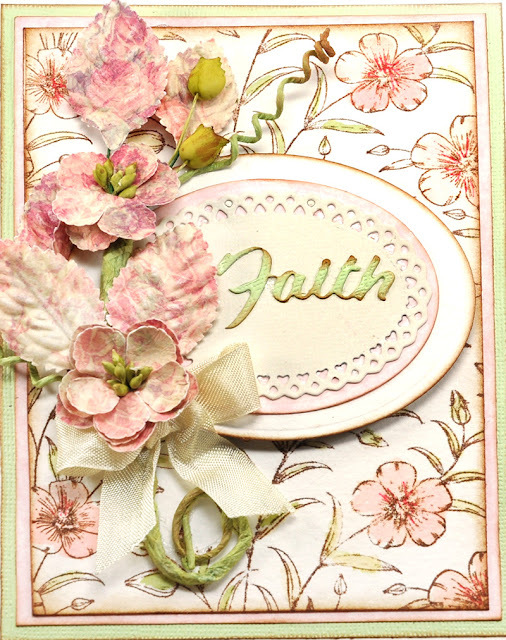 Photo credit shout out to Pamela Choate photography. Part two of my LemonCraft-i-ness is a card I created also using Lemoncraft 'EveryDay Spring' collection. 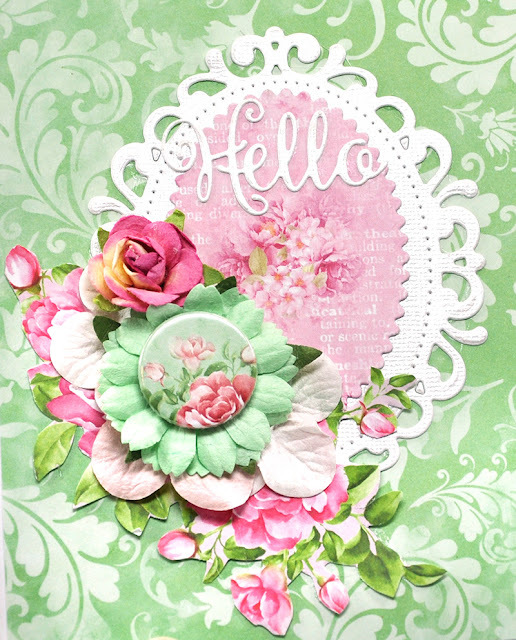 I Used the flowers and button on this card also - but I also cut some flowers from the gorgeous sheet of die cuts. 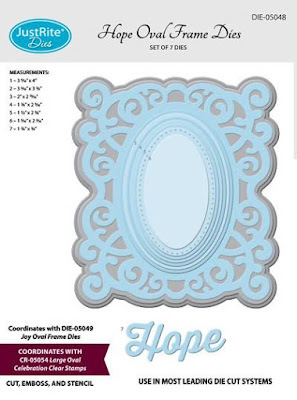 The pretty oval "frame" diecut is from JustRite Papercraft. 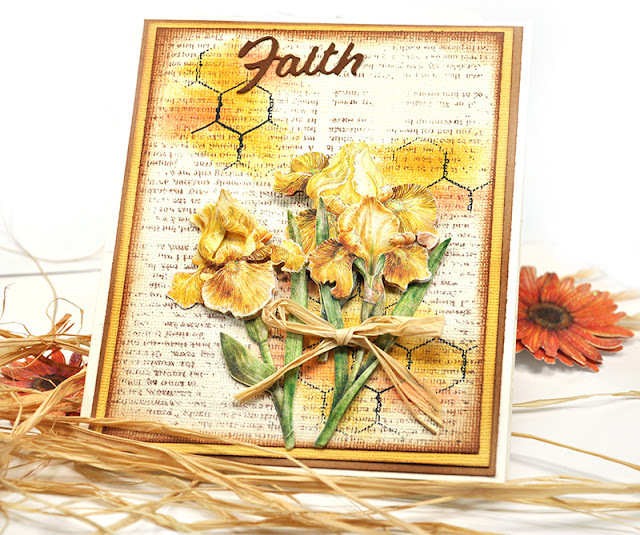 They have a beautiful selection of original dies and stamps. 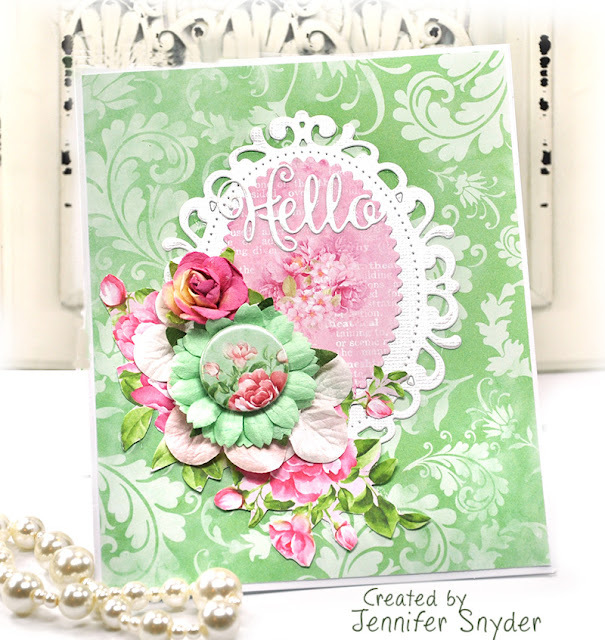 This is the JustRite Hello Decorative Oval Frame Die . 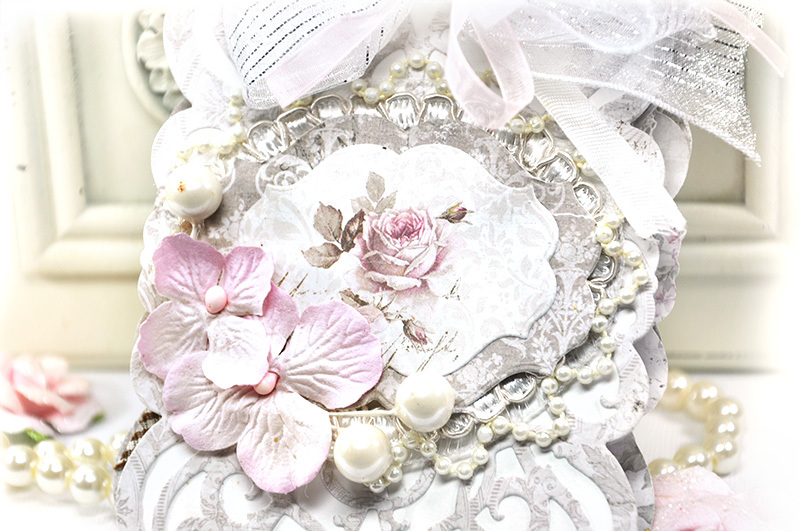 Be sure to visit the ETSY shop for 30% off all items listed until Sept 4th. Use code "Kitty30" at checkout. 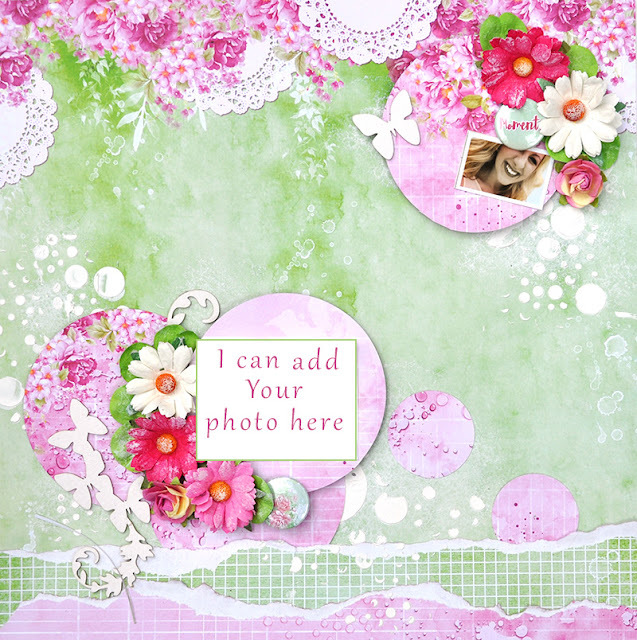 you can grab this layout at ETSY here. 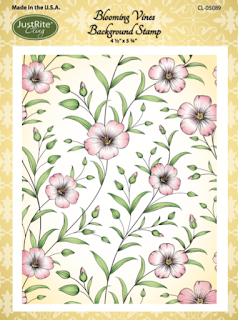 Grab this while it's available. I'm enjoying the opportunity to mix the Flying Unicorn kit with the wonderful dies from JustRite. 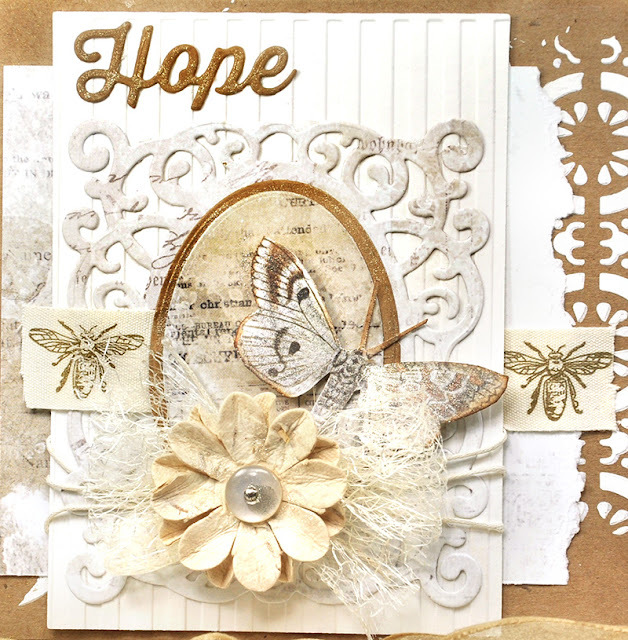 The Flying Unicorn kit for July had some wonderful rustic looking papers. The small 6x6 pad included in the kit for smaller projects and cards featured Prima's Vintage Emporium collection. 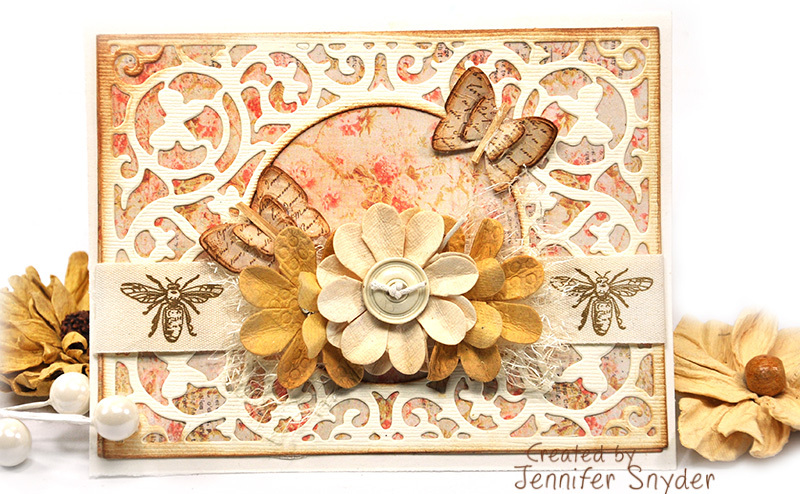 To help my card achieve that rustic look, I grabbed the Butterfly Cardfront Die from JustRite Papercraft. The sweet little butterflies on my card were also created by layering the tiny butterfly dies from the same die set. I added a bit of ink to the edges of the wings to set them off and give them some definition. There are also some additional detailed embellishments on the card that were included in the July Flying Unicorns kit; the bee trim. the flowers from 49 and Market paper company, the buttons and some web weave trim. The web weave is very subtle under the flowers but it's very cool stuff. One last close up for the day. 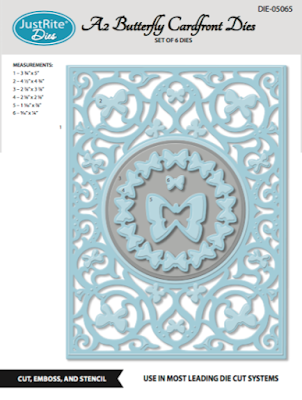 This image shows off the darling butterfly details in the die. They are subtle and sort of get lost in the image when seen at a distance, however up close they are perfectly sweet. I'm here to show off my wonderful JustRite Papercraft dies and stamps. Today I am featuring another new background stamp called "Blooming Vines". 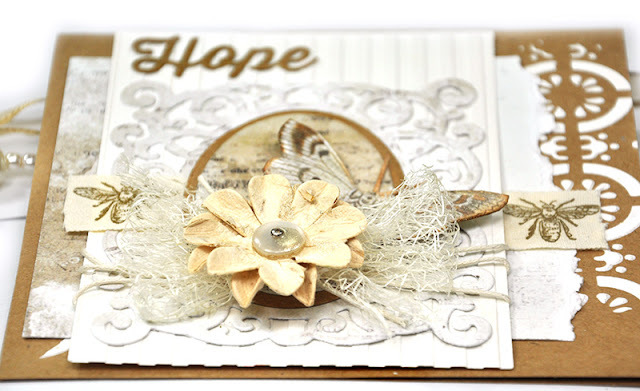 I showcased the Text and the Chicken Wire stamp already and they are marvelous. 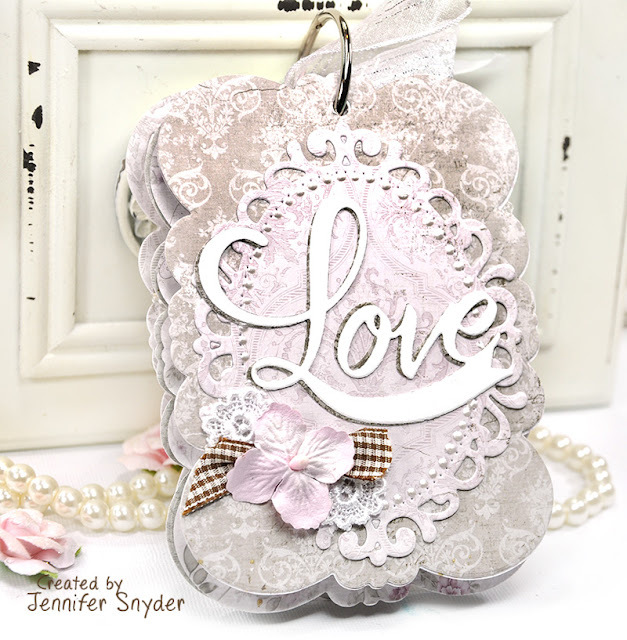 You can see the Text Background stamp and the Chicken Wire Background stamp here. 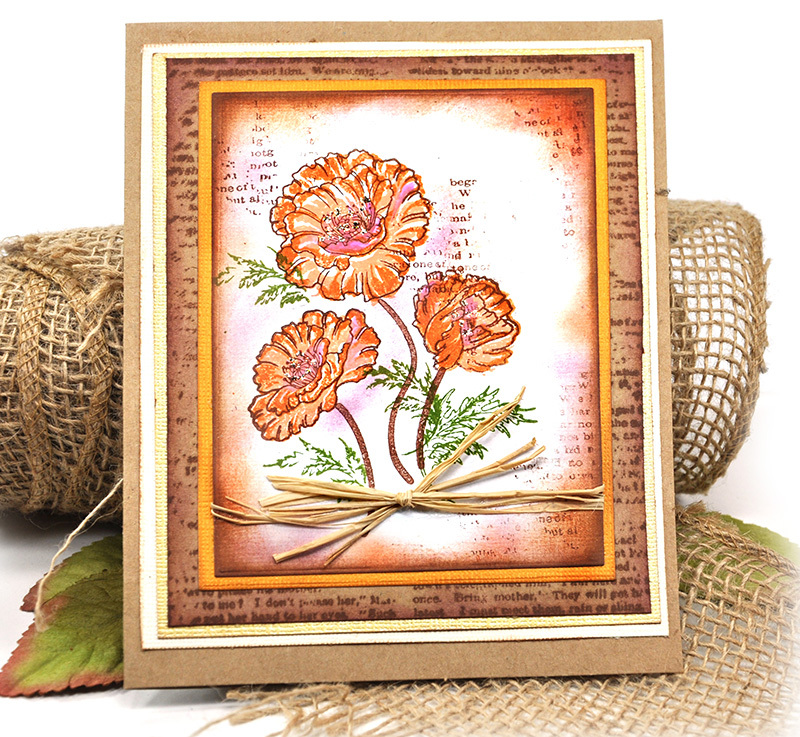 The "Blooming Vines" stamp is really delicate and beautiful. 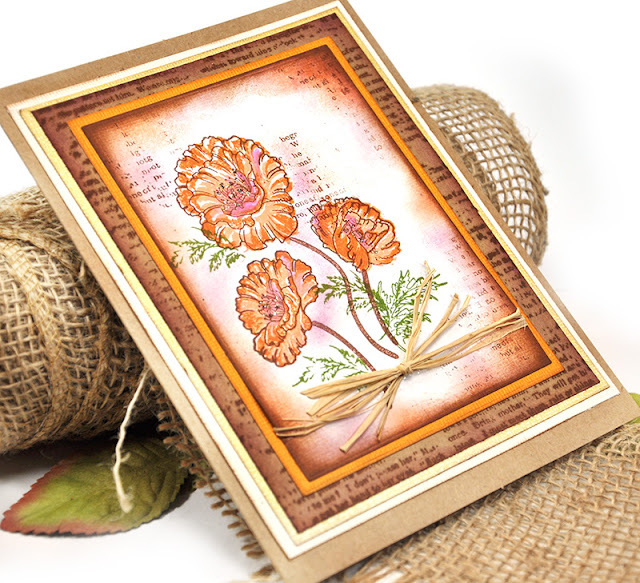 Stamp it on a card and leave it uncolored or add some pops of color and make a bold visual. I decided on a third option - color in softly with blush pinks and greens. 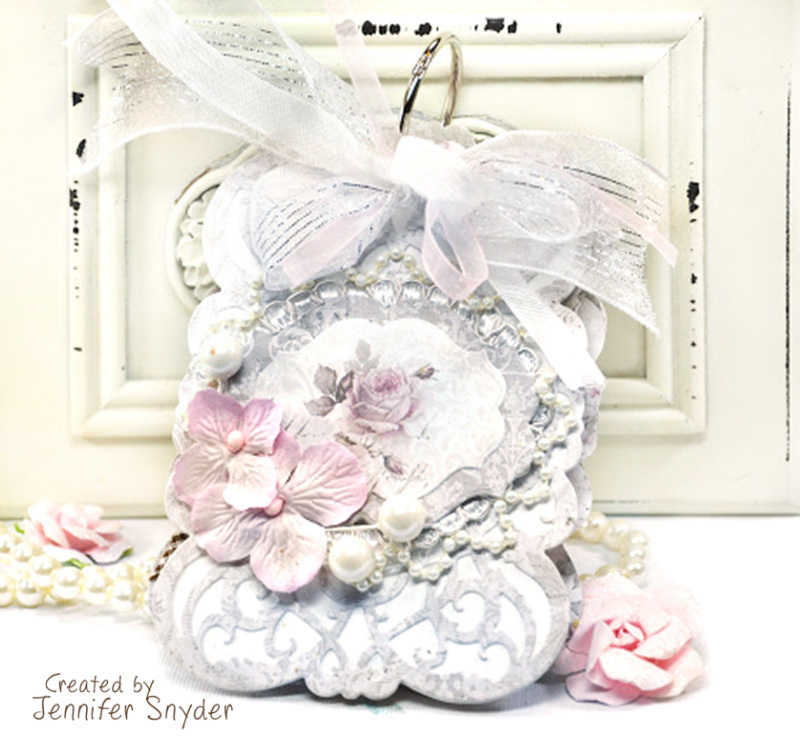 I used a waterbrush and really light watercolors from Prima's Watercolor Confections - Decadent Pies. The Confections are bold and gorgeously pigmented so I added more water to thin out the color. My card is topped with Prima flowers from the "Tales of You & Me " collection by Frank Garcia. 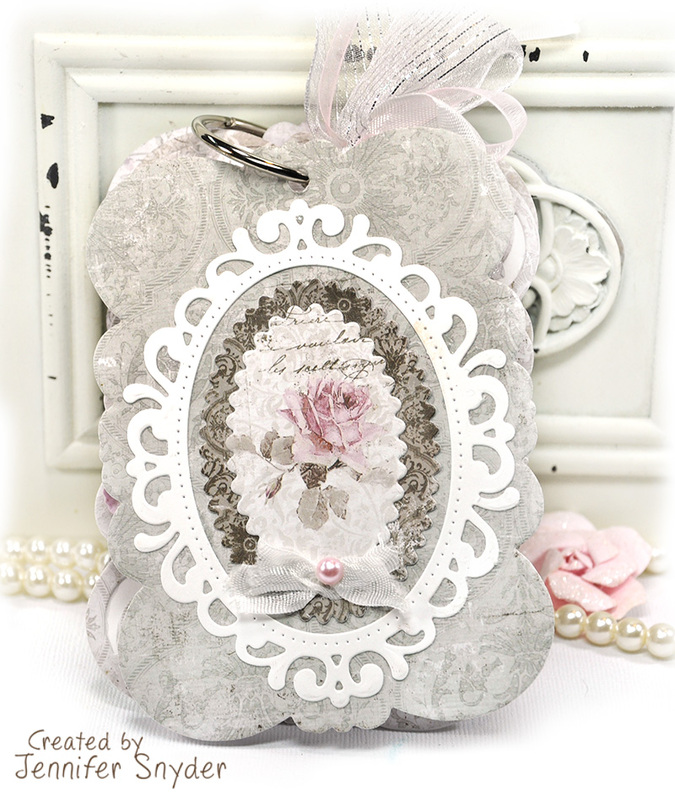 The flowers surround a graceful die set from JustRite - JustRite Papercrafts - Joy Oval Frame Die . The die has delicate little scalloped hearts all around the oval - really a simple yet elegant touch. My sentiment is the "Faith" die and it's is due to be released by JustRite soon! Stay tuned. 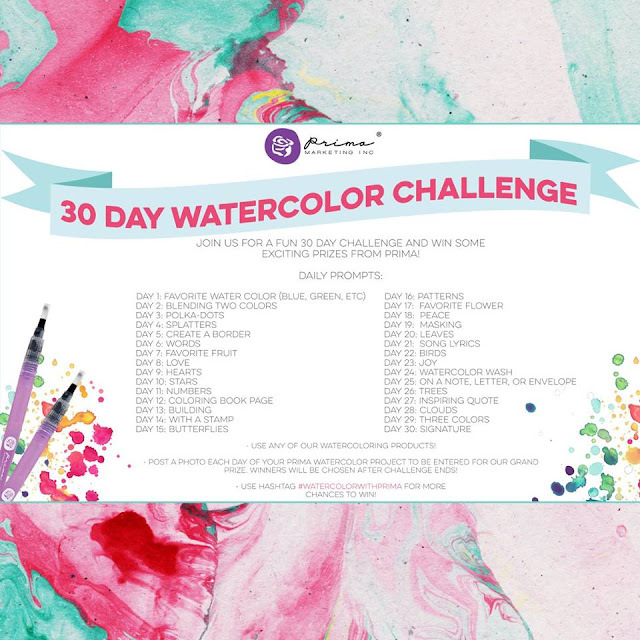 Prima Marketing is having a 30 Watercolor Challenge. I used this card to enter day 1, watercolors with a stamp, and day 24 - watercolor with a wash. You can play along as well. 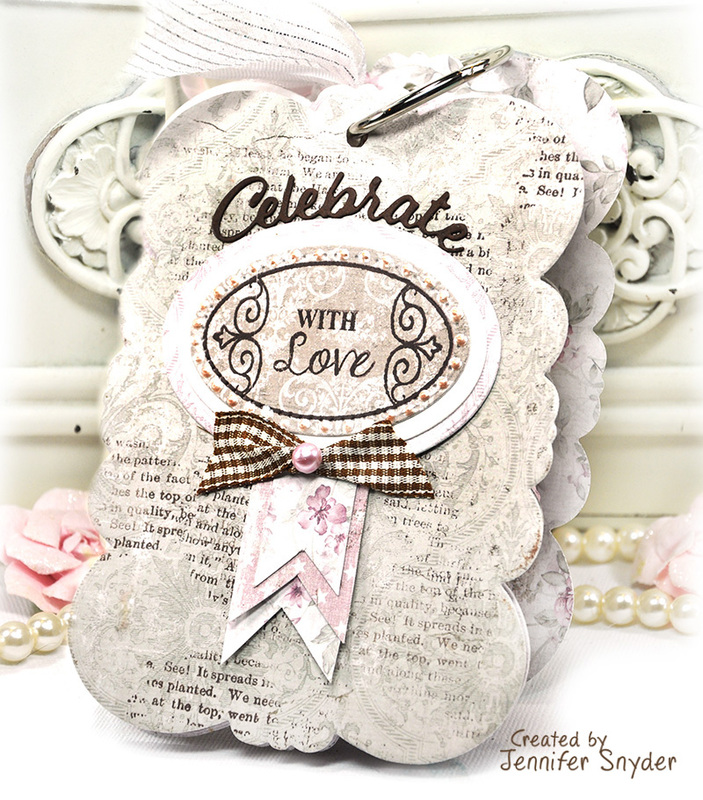 Rules are simple - grab some Prima Confections and pick a topic in the list below. Then post to Facebook using the hash tag #WATERCOLORWITHPRIMA. 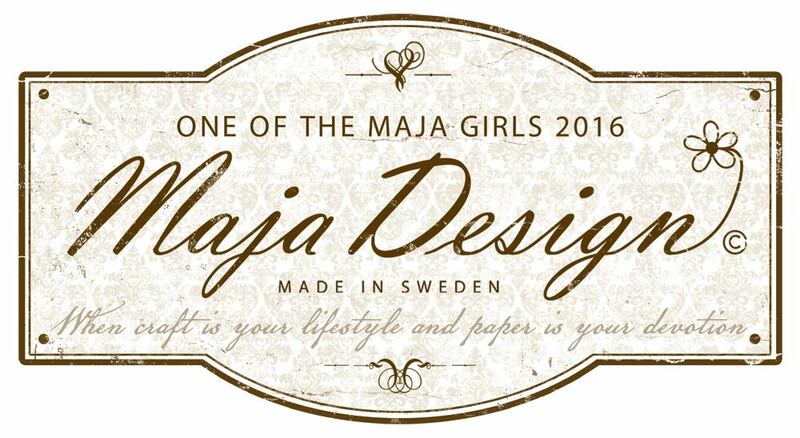 See details here. The JustRite stamps are perfect companions for this challenge. The July kit from the Flying Unicorns was quite a beautiful treat filled with natural elements and an earthy feel. The featured collection is Vintage Artistry from 49 and Market. The papers are beautifully subtle so I kept this piece in all neutrals and added some dies from JustRite Papercrafts. 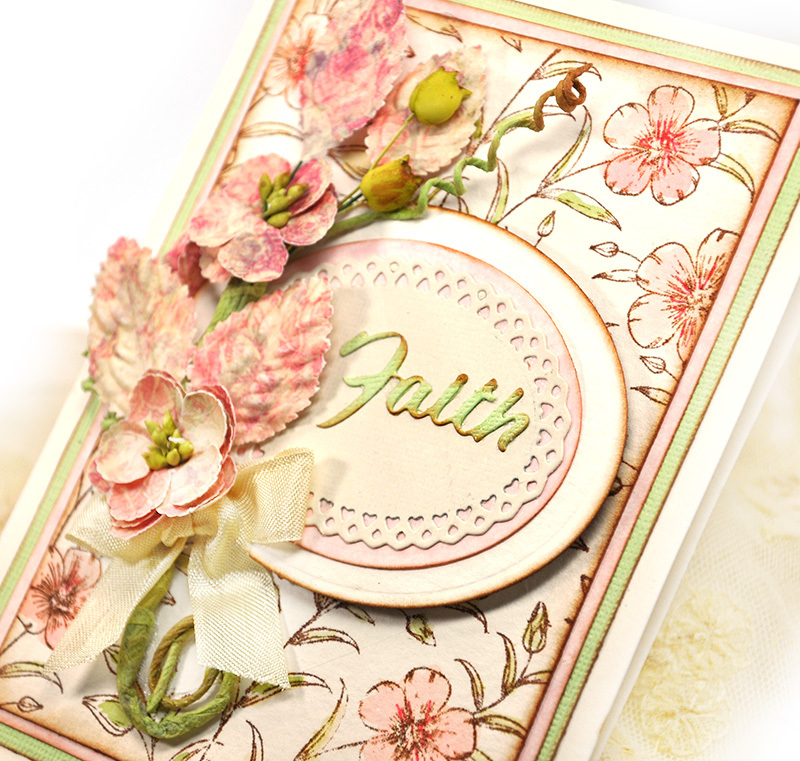 The kit also contained wonderful flowers from 49 and Market as well as a die cut sheet from the Vintage Artistry collection. 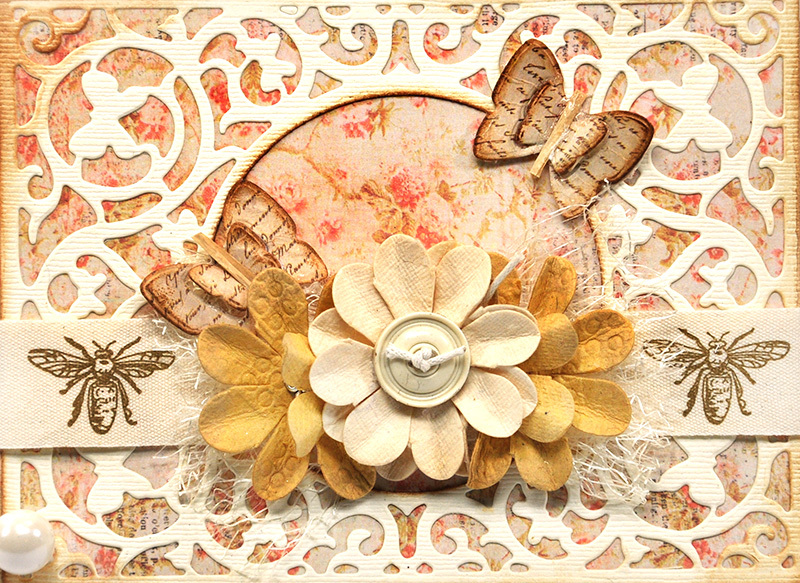 The beautiful butterfly was cut from the die cut sheet called Flora and Fauna. 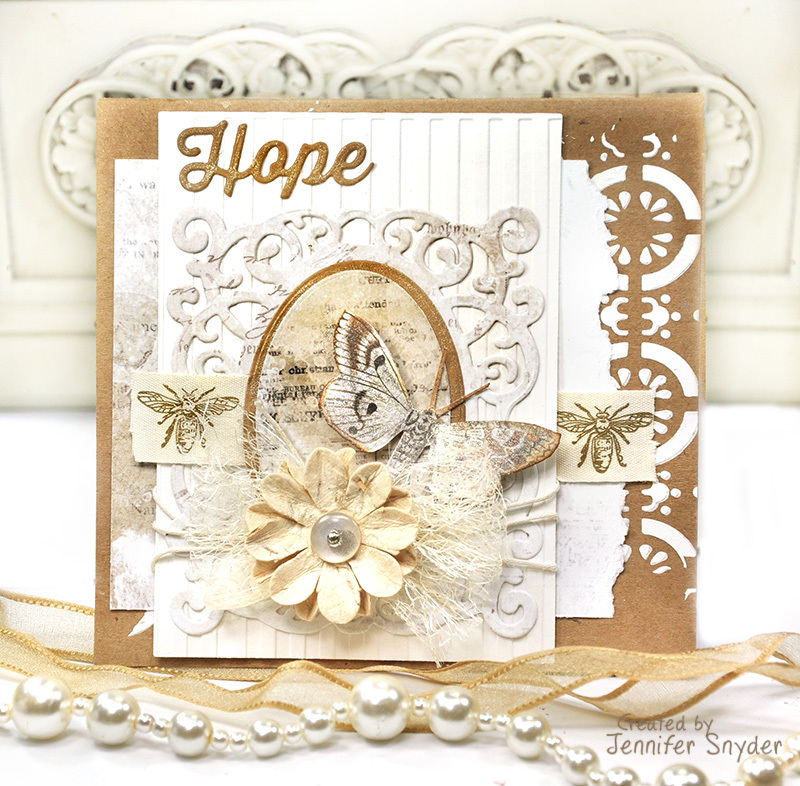 The die creates a beautiful delicate look. I'm showcasing some new stamps from JustRite today. They've added some cool versatile background stamps for cardmaking, layouts and mixed media. 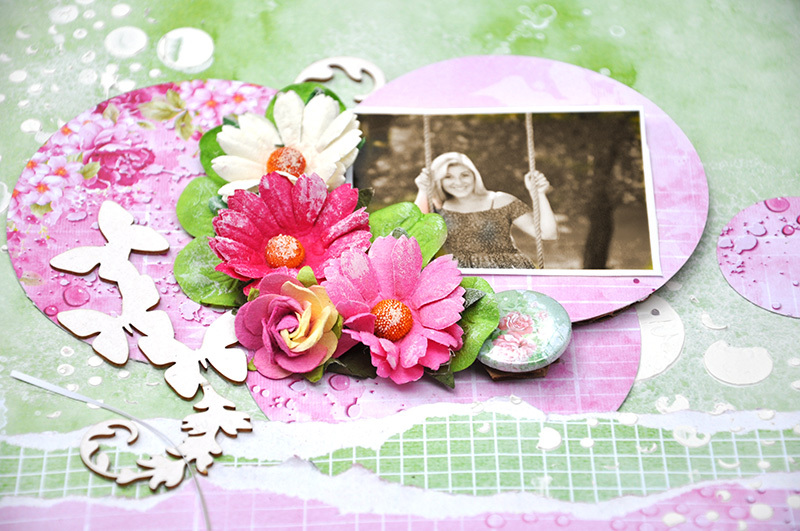 These will please anyone who loves to play with paper, stamps, paints and markers. Today's feature involves the Text Background Stamp and the Chicken Wire Stamp. 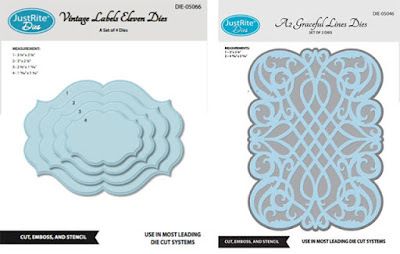 These are both pretty large cling stamps ( 4 1/4" x 5 1/2" ) -designed to fit an A2 sized card, but is also great for scrapbook pages and other mixed media projects. 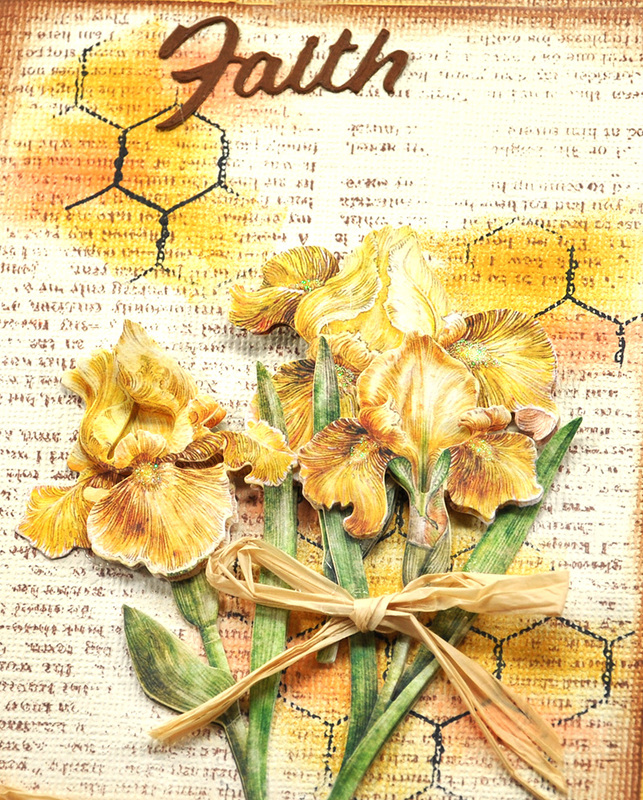 I've added some color to my card using Distress inks in Vintage Photo, Mustard, and Spiced Marmalade. The stickers are really old K&Co Iris stickers from my stash. 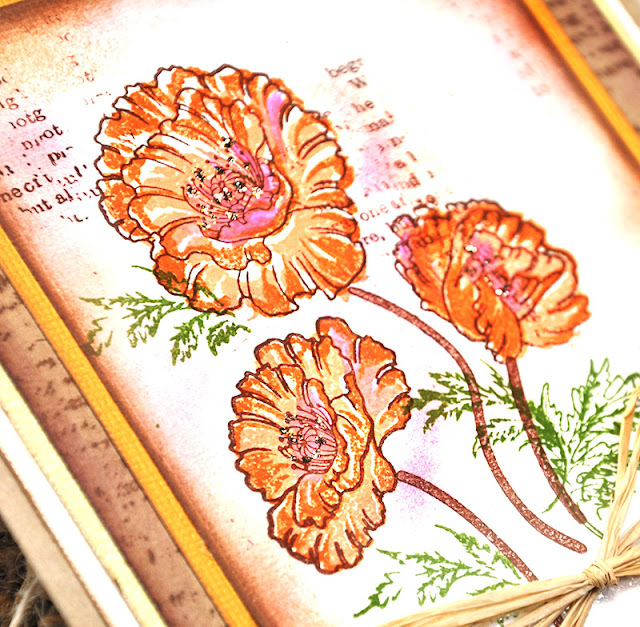 This is a multistep poppy stamp that helps you build your own flowers and ink as you go. Why are these so cool? 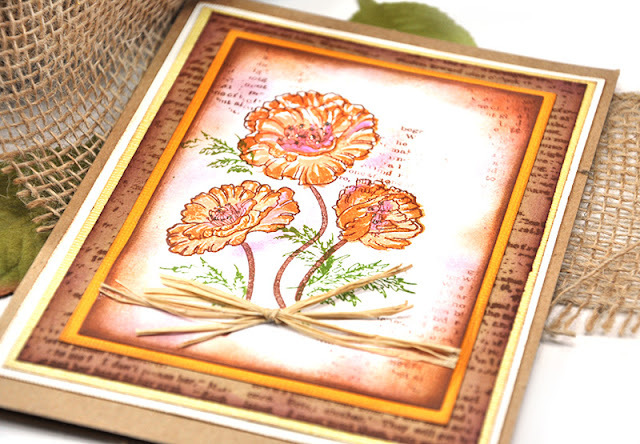 Picture this is your head.....You have a gorgeous poppy stamp and you want the final stamped image to have some definition when stamped. 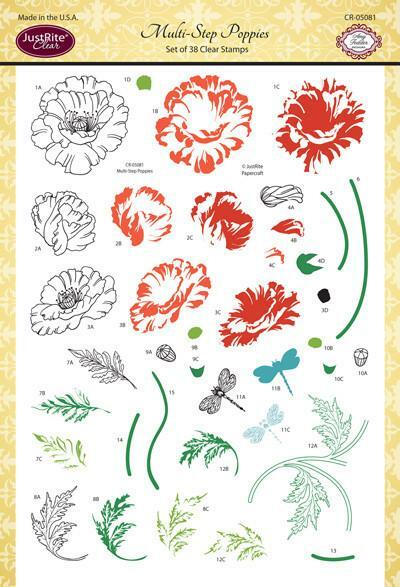 Perhaps you want the outline of the image to be bold black and you want the actual flower to be orange with a red /yellow inside. 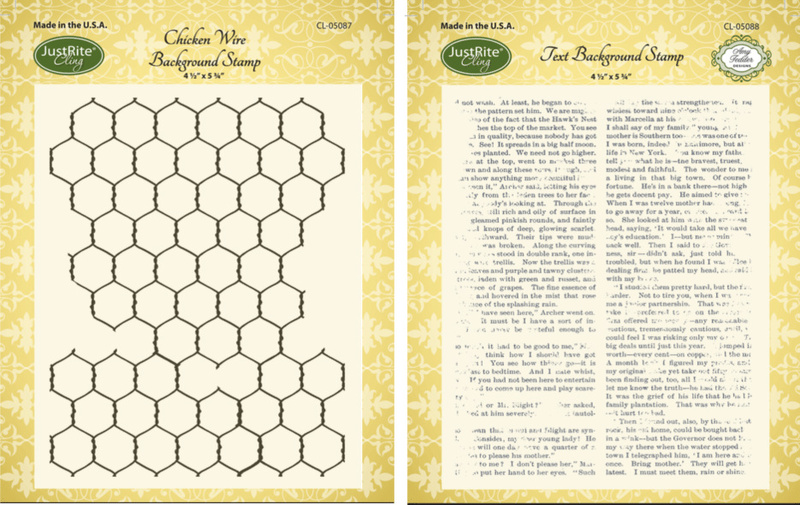 In the past you'd have to get out your colored markers and color the actual stamp with different colors, then stamp - while holding your breath for the results. No more! The guess work is gone. 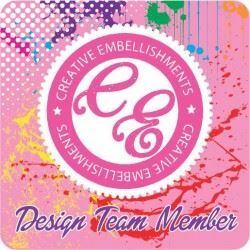 These let you decide how to color your image one stamp at a time. Go ahead and pull out the black and stamp. 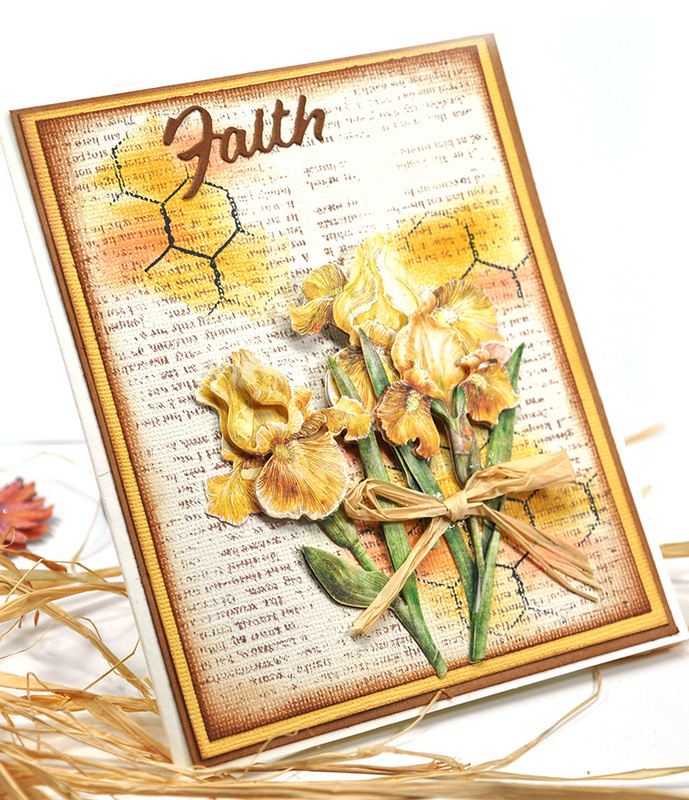 Next grab the orange and stamp away with confidence. Need a little red? That's cool. Go for it with one of the stamp layers. 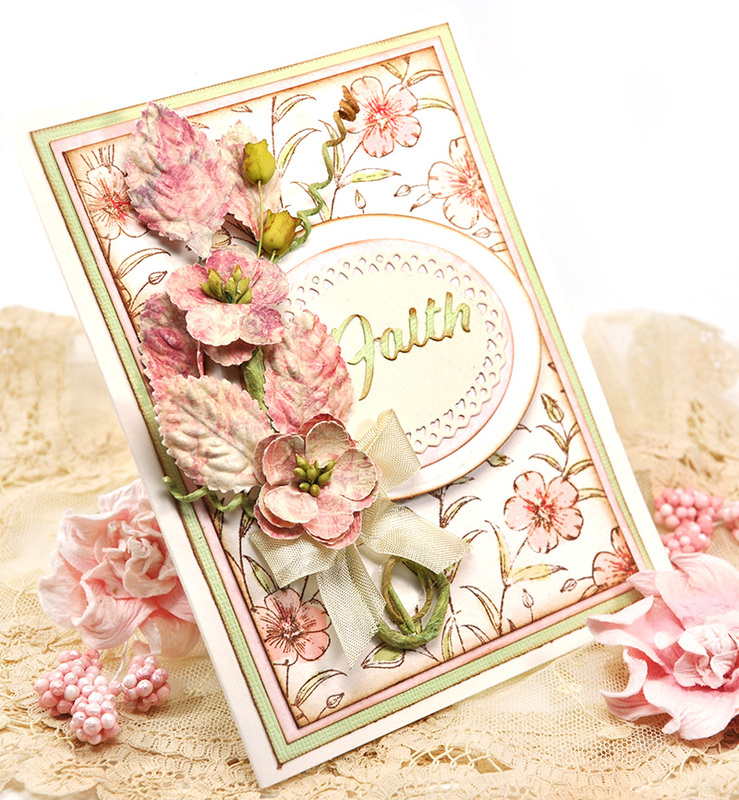 The background of this card was stamped using the new Text Background stamp from JustRite. 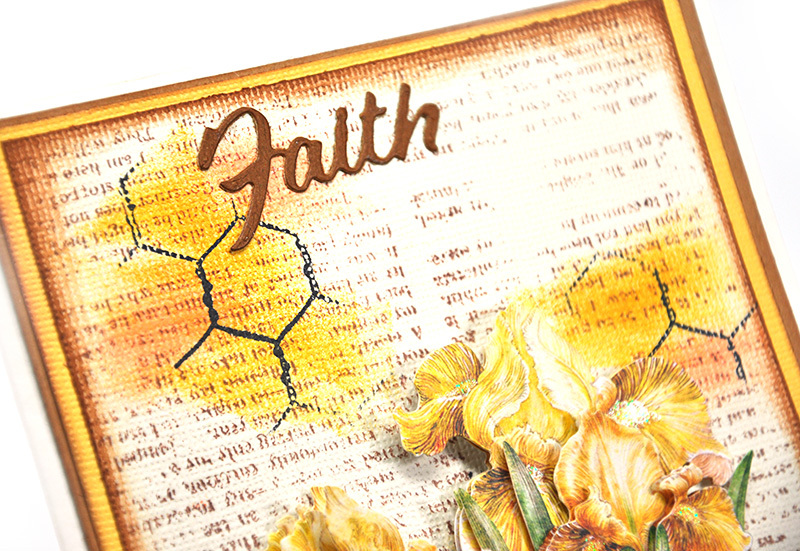 The stamp is quite large ( 4 1/4" x 5 1/2" ) -designed to fit an A2 sized card, but is also great for scrapbook pages and other mixed media projects. 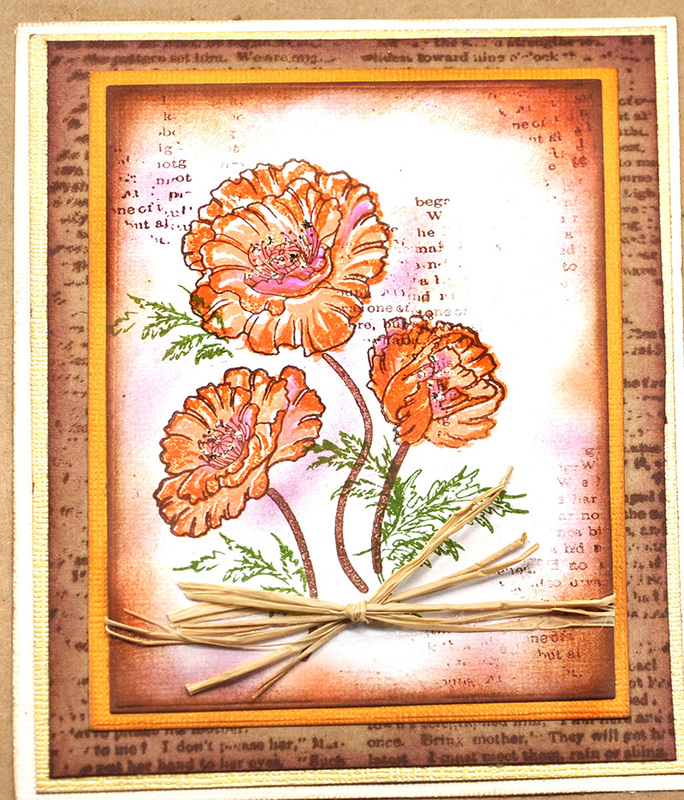 I've added a little dab of glitter in the center of the flowers. 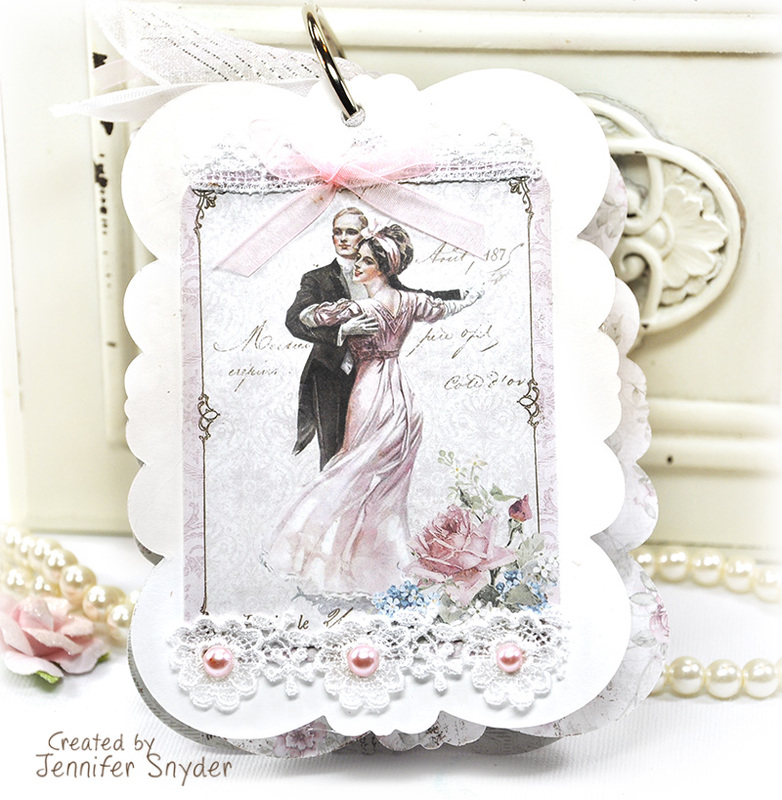 This is a mini-album wedding card that I created with the absolutely fabulous Maja Design Vintage Romance collection in conjunction with the newest dies and stamps from JustRite Papercrafts. 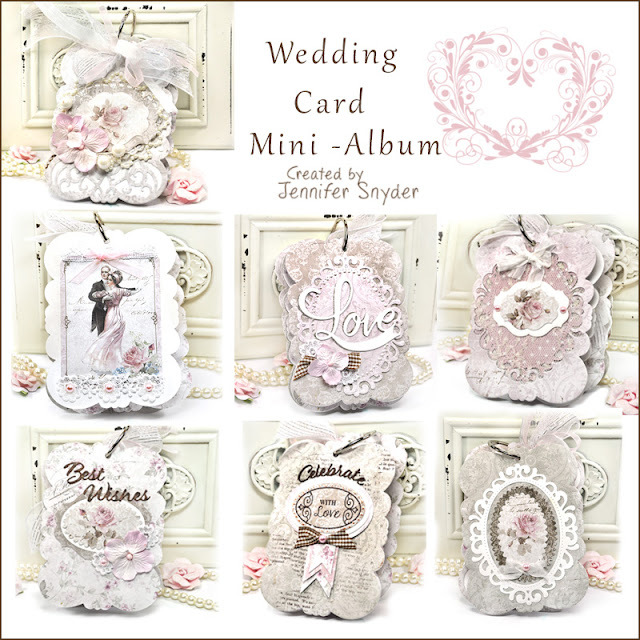 Mini-albums are really not something I enjoy - and truthfully this project didn't start out as a mini. It had its humble beginnings as a card. 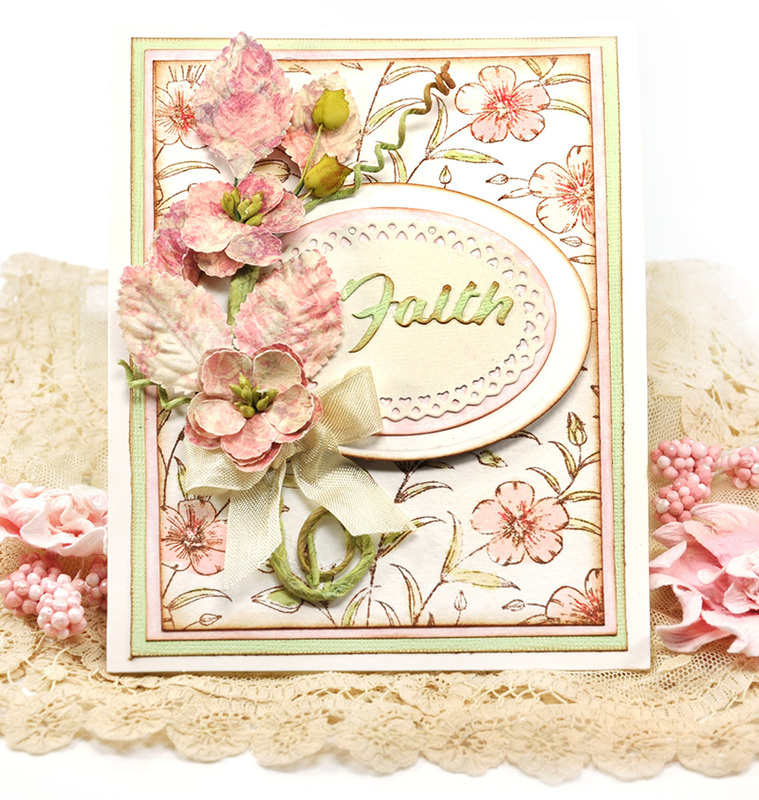 I pulled out my Maja Design and JustRite supplies and made a few diecuts using JustRite A2 Graceful Lines Die , which created the base shape of the card. 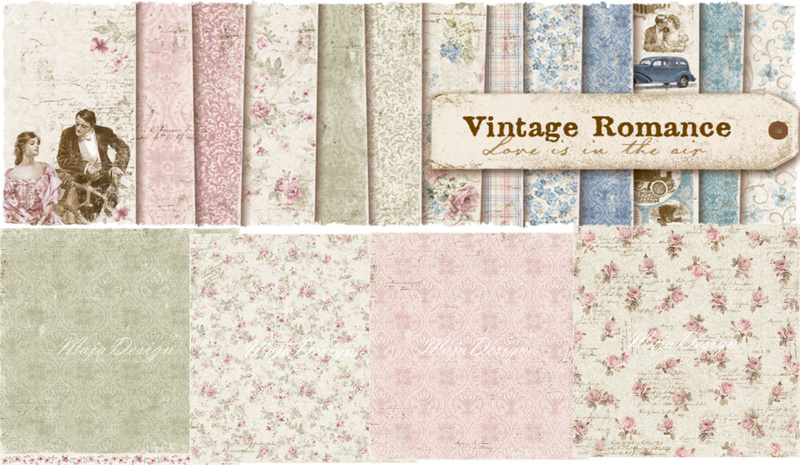 However the Maja Design Vintage Romance collection has too many gorgeous papers that I needed to try die cutting a few of the sheets to decide which ones I liked best for my card. 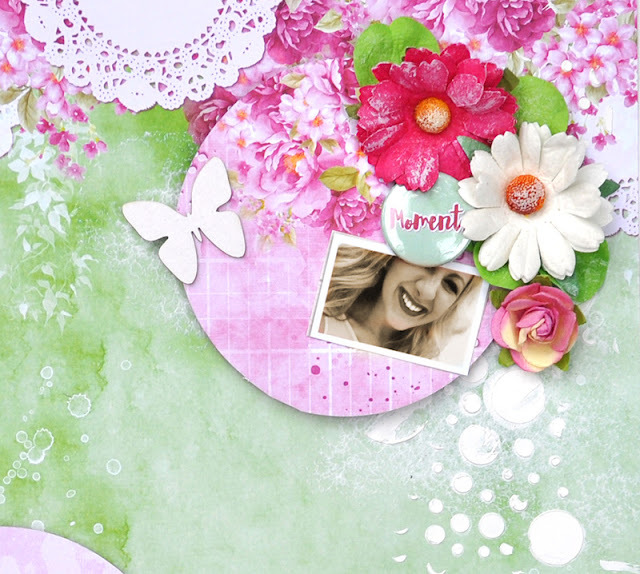 It got crazy at my house - more indecision - more die cuts - more beauty - more confusion. Finally I looked at the beautiful elegant pile on my desk and realized I didn't need to decide. A mini-album was born. 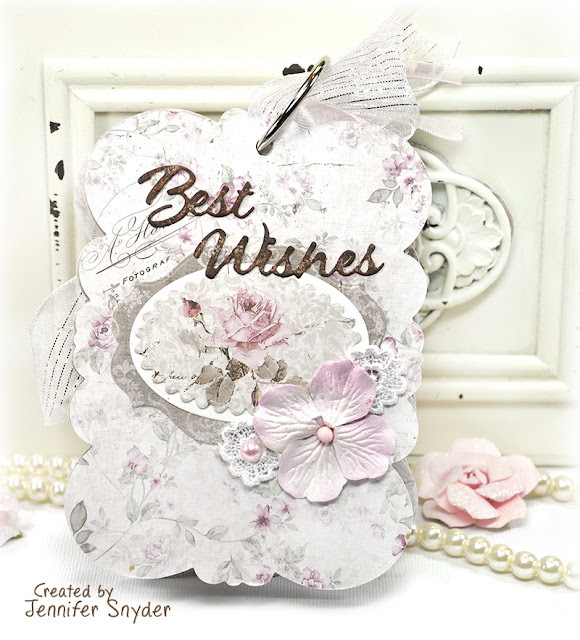 This is the front of my card. As you can see, I punched a hole in all the pages and ran a binder ring through them. Easy. 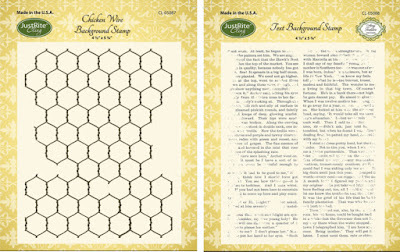 ( Just make your life easy and punch all the holes at one time in a stack so they all match up and are perfect). 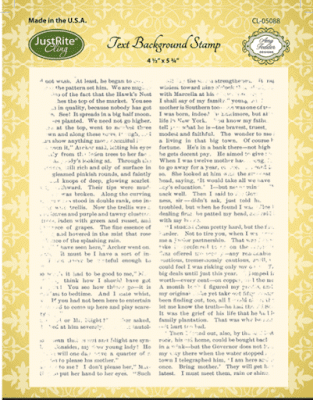 Page 2 - the inside page is a graphic from the sheet of Ephemera Cards from the collection. 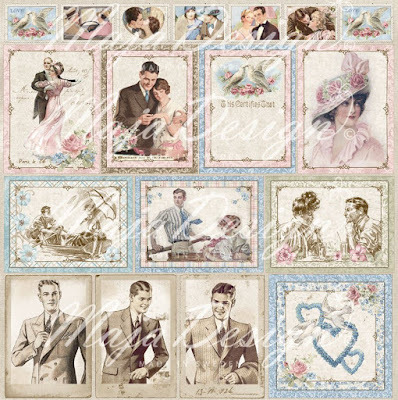 Isn't this sheet of Ephemera Cards just divine? Page three and four were sort of made at the same time. I used the JustRite Hello Decorative Oval Frame Die for the oval shape. 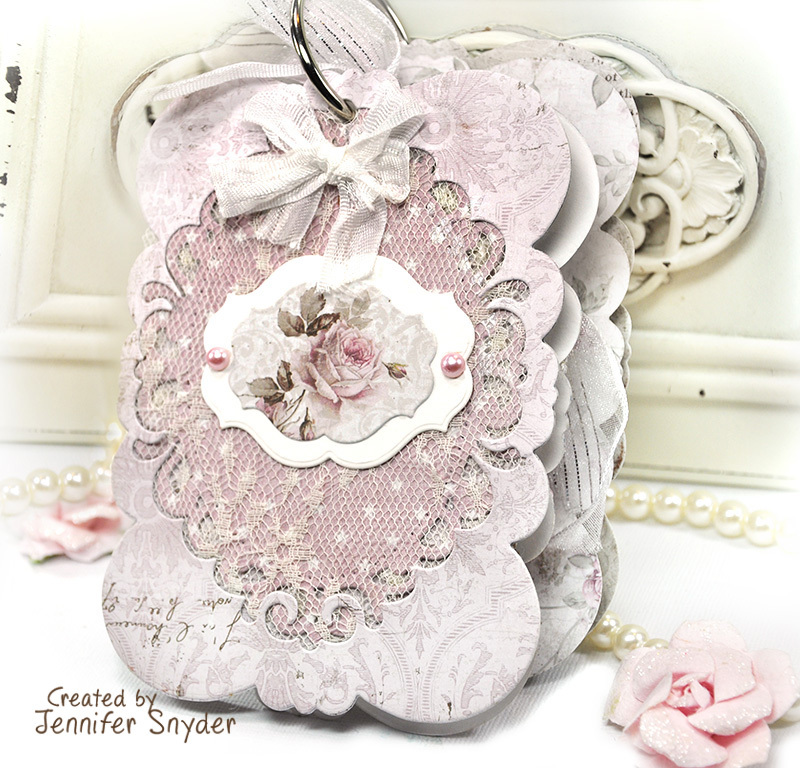 I cut the oval from one sheet of Vintage Romance, then added lace to the back of the negative space. 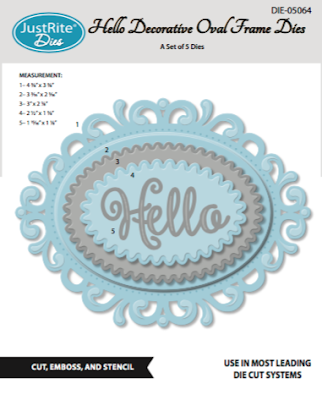 The actual die cut oval was then used on page four as the focal point. The word "Love " is also a die from JustRite - JustRite Love Sentiment Die. 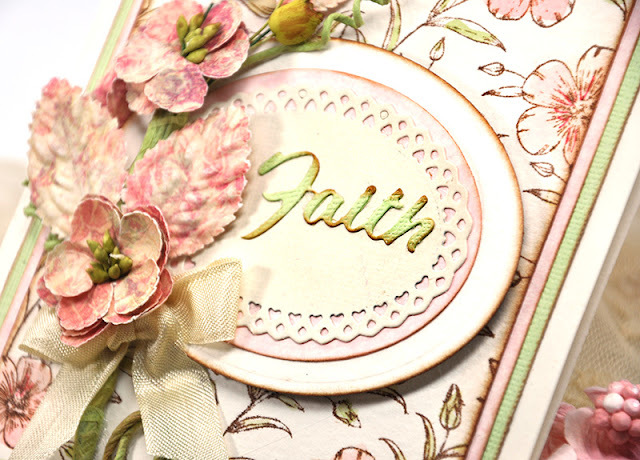 The next page utilizes the dies as the center embellishment. 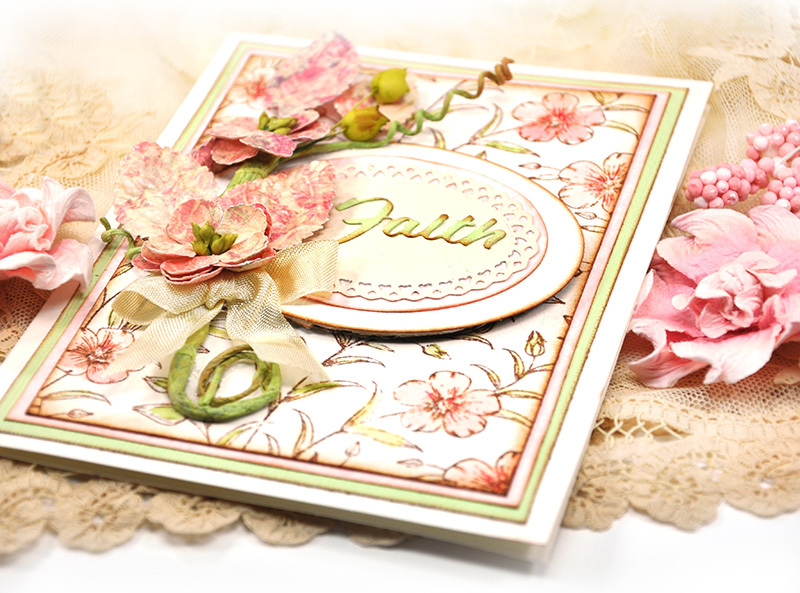 This page has a few JustRite stamps added to it for accent and a sentiment.